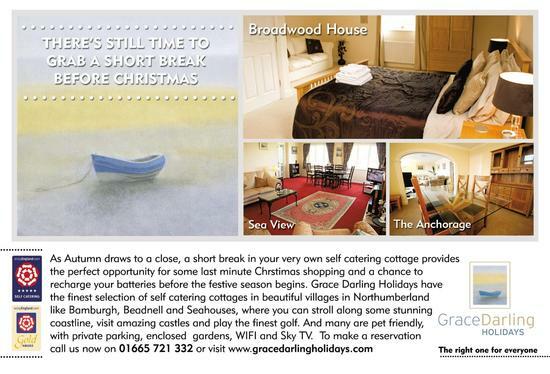 Welcome to Grace Darling Holidays. With over 40 years of experience, we specialise in offering beautiful self-catering properties along the picturesque Northumberland coast. We are delighted to announce a new range based in Fort Augustus in the Scottish Highlands. Northumberland combines natural beauty with ancient history, making it a truly special retreat. Our cottages cater to all, from couples looking for a romantic, luxury break, to families searching for a home-away-from-home. Properties in our portfolio \u2013 situated across quaint villages and settlements including Beadnell, Seahouses, Bamburgh and Newton-by-the-Sea \u2013 include everything from quaint cottages, barn conversions and townhouses, to one very special country manor. Even better, most are pet-friendly. Nearby attractions include World Heritage Site Hadrian\u2019s Wall, striking historic castles, golden beaches, rocky cliffs and woodlands.